ST. PAUL, Minn. (AP) — The Minnesota Wild started the season sluggishly, with a four-day break on the schedule following two flat performances. The spark came midway through this matchup with division rival Chicago, with a big push by Jason Zucker. Ryan Suter tied the game with 23 seconds left in the third period and Zucker scored in overtime, rallying the Wild past the Blackhawks 4-3 on Thursday night. Zucker had two goals and an assist, including a breakaway backhander 3:25 into the extra period. Zach Parise sent a long pass across the red line to a streaking Zucker, whose shot zipped between Cam Ward’s pads to give the Wild (1-1-1) their first win of the season. Suter’s takeaway gave the Wild possession on that play, after he batted in a backhander off a short-handed rebound of Parise’s shot to make it 3-3. The 14-year veteran defenseman, coming off a career-threatening ankle injury in April, had two assists. Particularly his tying goal that emerged from a mass of bodies in front of the net. Alex DeBrincat had two goals and an assist for the Blackhawks, including a go-ahead score on a power play early in the third period, but Devan Dubnyk made 27 saves for the Wild including a thumping denial with his pad of Patrick Kane’s close-range try in overtime. Jonathan Toews kept up his season-opening surge with two assists for the Blackahwks. He set up DeBrincat’s first score during a 4-on-4 with a hard stop on a rush to slide the puck across the slot. Then he fed rookie Dominik Kahun for his first NHL goal less than three minutes later. Patrick Kane assisted on DeBrincat’s second score, giving the Toews-Kane-DeBrincat trio a whopping 22 points in four games. Toews has a team-leading five goals and three assists for the Blackhawks (2-0-2), who have 18 goals in four games after missing the playoffs last spring for the first time in 10 years. Still, on a power play with 1:17 remaining in the third period, they couldn’t help but be frustrated with the outcome. Ward, keeping the net warm for the expected return next week of Corey Crawford from a concussion that cut short his 2017-18 season, made a season-high 42 saves for the Blackhawks. Each of their four games have been decided in overtime. Eric Staal scored for Minnesota in the second period, and Zucker tied it with 2.8 seconds left before the second intermission by snagging Staal’s off-target pass and knocking it past Ward. NOTES: The 20-year-old DeBrincat, playing on the Toews-anchored first line with Kahun, has 59 points in 86 career games. 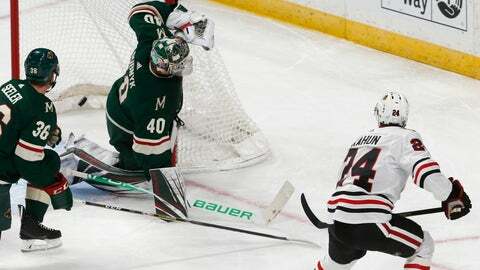 … The Wild are 12-4-1 in their last 17 games against the Blackhawks. … RW J.T. Brown made his debut with the Wild after being scratched the first two games. He replaced Matt Hendricks on the fourth line. … The Wild are 0 for 7 on the power play this season. … LW Alexandre Fortin, who played on the third line for the Blackhawks with Chris Kunitz and Artem Anisimov, made his NHL debut. He’s already the fourth Blackhawks player to do so this season. One of them is Luke Johnson, who was scratched to make room for Fortin. … This was Zucker’s second career overtime goal. Blackhawks: Host the St. Louis Blues on Saturday. Wild: Host the Carolina Hurricanes on Saturday.